The most favorable advantage of robotic surgery is the markedly free movement of joint-equipped robotic forceps under 3-dimensional high-vision. Accurate operation makes complex procedures straightforward, and may overcome weak points of the previous thoracoscopic surgery. The efficiency and safety improves with acquiring skills. 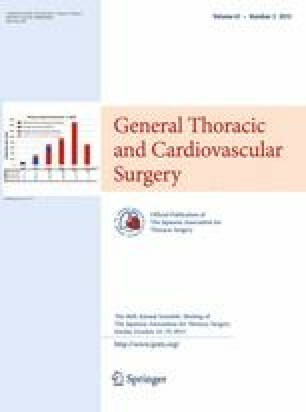 However, the spread of robotic surgery in the general thoracic surgery field has been delayed compared to those in other fields. The surgical indications include primary lung cancer, thymic diseases, and mediastinal tumors, but it is unclear whether the technical advantages felt by operators are directly connected to merits for patients. Moreover, problems concerning the cost and education have not been solved. Although evidence is insufficient for robotic thoracic surgery, it may be an extension of thoracoscopic surgery, and reports showing its usefulness for primary lung cancer, myasthenia gravis, and thymoma have been accumulating. Advancing robot technology has a possibility to markedly change general thoracic surgery. The review was submitted at the invitation of the editorial committee.